Tips from one fairy to another! Gathering materials such as Sticks, Roses, and Honey Combs, can be used for money to buy items. Gathering alone is the way to go, unless your hunting for bunches in the ballroom. Best meadows for gathering are: NeverBerry Thicket, CottonPuff Field, and MapleTree Hill. Use our Ingredient Chart to know exactly where to locate your desired ingredient! A party is a super fun way to win ingredients, make friends, and even collect more talent points! Learn how to make a party HERE. Don't just invite your friends, go to Havendish Square on Hidden Ridge, and tell people about your party. You might even make new friends! A selected judge (usually the house owner) will say a theme (e.g. Blue, Random, Christmas) for you to dress up to. Then her and/or a few other people will judge who created the best dress. The tip for Fashion cons would be to have a viarety of colored clothing. What if you're not a member and don't have a lot of clothes? Then you can become one of the Judges, which is equally as fun! Vidia's Daily Spin is located in Acorn Summit, right above Summit Style. 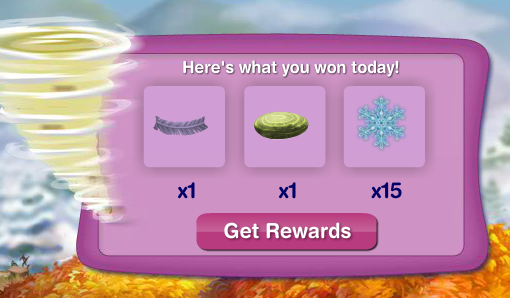 The goal of the game is to try to click on the acorns in a mini tornado Vidia stur's up for you to win prizes. Come back every day for new prizes! If you're a regular Member, you get to try ONCE, if you're a paid member, you get to try THREE times. Do you want more friends in the hollow? Here's how! Talk to people! Don't be shy! The more people you talk to the more changed of finding a friend! Be nice to both members and non members! Here's how to have a great time shopping. Don't waste all of your pixie diamonds on small stuff that you can use ingredients on. Save them for diamond exclusive items! Shop with friends! They will always tell you what looks good and doesn't. Fly over to your garden and plant them! Check back every day to take care of your garden! Harvest your items when they're ready!